Today, we’re excited to share the first native support for gRPC traffic, released in NGINX Open Source 1.13.10. NGINX Plus Release 15 includes gRPC support as well as the support for HTTP/2 server push introduced in NGINX 1.13.9. Publish a gRPC service, and then use NGINX to apply HTTP/2 TLS encryption, rate limits, IP address‑based access control lists, and logging. You can operate the service using unencrypted HTTP/2 (h2c cleartext) or wrap TLS encryption and authentication around the service. Publish multiple gRPC services through a single endpoint, using NGINX to inspect and route calls to each internal service. You can even use the same endpoint for other HTTPS and HTTP/2 services, such as websites and REST‑based APIs. Load balance a cluster of gRPC services, using Round Robin, Least Connections, or other methods to distribute calls across the cluster. You can then scale your gRPC‑based service when you need additional capacity. 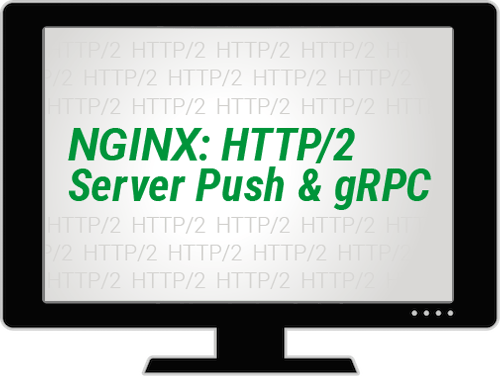 To learn more, watch our on-demand webinar, NGINX: HTTP/2 Server Push and gRPC. gRPC is a remote procedure call protocol, used for communication between client and server applications. It is designed to be compact (space‑efficient) and portable across multiple languages, and it supports both request‑response and streaming interactions. The protocol is gaining popularity, including in service mesh implementations, because of its widespread language support and simple user‑facing design. gRPC is transported over HTTP/2, either in cleartext or TLS‑encrypted. A gRPC call is implemented as an HTTP POST request with an efficiently encoded body (protocol buffers are the standard encoding). gRPC responses use a similarly encoded body and use HTTP trailers to send the status code at the end of the response. By design, the gRPC protocol cannot be transported over HTTP/1.x. The gRPC protocol mandates HTTP/2 in order to take advantage of the multiplexing and streaming features of an HTTP/2 connection. The following examples use variants of the gRPC Hello World quickstart tutorials to create simple client and server applications. We share details of the NGINX configuration; the implementation of the client and server applications is left as an exercise for the reader, but we do share some hints. First, we interpose NGINX between the client and server applications. NGINX then provides a stable, reliable gateway for the server applications. Ensure that the address in the grpc_pass directive is correct. Recompile your client to point to NGINX’s IP address and listen port. 192.168.20.11 - - [01/Mar/2018:13:35:02 +0000] "POST /helloworld.Greeter/SayHello HTTP/2.0" 200 18 "-" "grpc-go/1.11.0-dev"
192.168.20.11 - - [01/Mar/2018:13:35:02 +0000] "POST /helloworld.Greeter/SayHelloAgain HTTP/2.0" 200 24 "-" "grpc-go/1.11.0-dev"
Note: NGINX does not support HTTP/1.x and HTTP/2 at the same time on a cleartext (non-TLS) port. It needs prior knowledge of which version of the protocol to use. If you want to handle both protocol versions over cleartext, create a listen port for each. The Hello World quickstart examples use unencrypted HTTP/2 (cleartext) to communicate. This is much simpler to test and deploy, but it does not provide the encryption needed for a production deployment. You can use NGINX to add this encryption layer. That’s all you need to do to secure your gRPC traffic using NGINX. In a production deployment, you need to replace the self‑signed certificate with one issued by a trusted certificate authority (CA). The clients must then be configured to trust that CA. What can you do if you have multiple gRPC services, each implemented by a different server application? Wouldn’t it be great if you could publish all these services through a single, TLS‑encrypted endpoint? You can try this out yourself. Here we’ve extended the sample Hello World package (in helloworld.proto) to add a new service named Dispatcher, then created a new server application that implements the Dispatcher methods. The client uses a single HTTP/2 connection to issue RPC calls for both the Greeter and Dispatcher services. NGINX separates the calls and routes each to the appropriate gRPC server. Note the “catch‑all” location / block. This block handles requests that do not match known gRPC calls. You can use location blocks like this to deliver web content and other, non‑gRPC services from the same, TLS‑encrypted endpoint. Of course, you can use grpc_pass grpcs://upstreams if your upstreams are listening on TLS. NGINX can employ a range of load‑balancing algorithms to distribute the gRPC calls across the upstream gRPC servers. NGINX’s built‑in health checks detect if a server fails to respond, or generates errors, and then take that server out of rotation. If no servers are available, the /error502grpc location returns a gRPC‑compliant error message. This is the initial release of our gRPC proxy support. Maxim Dounin was the lead developer for this feature, and we would also like to thank Piotr Sikora for his early patches and guidance. Please feel free to share any feedback in the Comments below, or through our community mailing list, and submit any confirmed bug reports to our Trac bug tracker. In this webinar we will discuss how to use NGINX for both HTTP/2 server push and for proxying gRPC traffic.